Wasteful Spending . . .
New Hartford Town officials again insist on shoving a new court house down the taxpayers' throats after taxpayers already rejected the idea. But the Town's population is not growing! As the town’s regional popularity as a retail center has grown, so have the number of people who show up in traffic and criminal court, said William Virkler, who’s been a town justice for nine years. And who allowed -- even cheered -- the Town's "regional" popularity as a retail center? It was NOT the residents who are now expected to come up with money. They were looking for the quiet suburban life, but that was taken from them. Bad choices by greedy/ambitious Town fathers and their developer friends have brought about urban sprawl, the cost of which is now coming due. 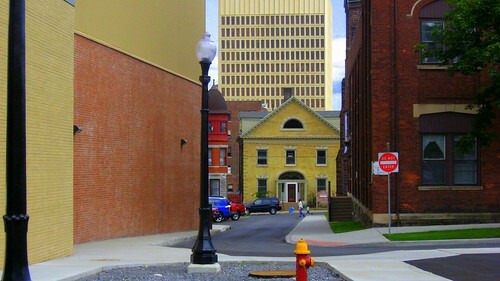 Enter into a sharing agreement with the City of Utica to use its court house. City court generally operates during days, Town Court in the evenings. Such an arrangement could benefit both Town and City taxpayers... and maybe pave the way for more consolidation in the future. There is so much wrong with this whole situation . . .
1) Route 840 does not need another intersection to slow things down. The DOT also does not consider an intersection the best solution, said Stephen Zywiak, regional design engineer for the DOT. But the department is acting at the request of the Town of New Hartford. I don't understand the DOT. It insists on ramming the Arterial through west Utica, disrupting what's left of the existing street grid and making the adjoining areas (which already have the infrastructure necessary for development) virtually undevelopable, but is ready to allow grade crossings on what was supposed to be a limited access highway in New Hartford to encourage development. Acting at the request of the Town is Bullcrap. Route 840 was put through undeveloped land. It is a route commuters use to get to the Thruway to go to Syracuse. New Hartford had the obligation to ensure that no additional burden would be placed on 840 BEFORE approving the Business Park project. An additional access point should never have been expected. 2) New Hartford residents should not be made to pay to construct an intersection for a private development. The residents don't need this development. It is the ambition of a private businessman. private  corporation  or  association, or private undertaking . . . .
4) The NH School District has no right to agree to this scheme. The school board's powers are exclusively conferred by the State Education Law. There is nothing in the Ed Law that authorizes school boards to enter into agreements to achieve non-education related purposes. 5) It promotes urban sprawl. This is another area that the Town will have to service with police, fire protection and road maintenance. Meanwhile, orchards and open space, amenities that attracted people to live in New Hartford, are being lost -- with Town and County governments cheer leading! 6) It promotes urban decay. There are plenty of other places available in the region where the Hartford and the other facilities could have located . . . places where services are already in place, but are not being used. The Boserts, Washington Courts, and Bendix sites in Utica come immediately to mind, all of which are located more central to the regional population and already have good road access. If there is a market in the region for the facilities they could have been encouraged to locate in these areas rather than on a greenfield ... but no one tried. 7) It is closed government in operation again! “Everybody would love to have a bridge,” New Hartford Central School District Superintendent Daniel Gilligan said. “But if it can’t be a bridge, it’s got to be an intersection and the reason is a commitment was made to the 650 employees of the Hartford insurance company.” . . .
Commitments? Deals? When and how were these done? How can a Town (or, worse, a school district) commit access to a state highway? Will someone please tell me why a school superintendent thinks it is his job to make a commitment to a private business for a road? This is all starting to sound like Dogpatch County: side-bar "deals" and "understandings" to serve private interests -- where things will go wrong -- and where the taxpayer gets hosed. I'm not going to even try to blog on this topic, because NH Online has done an outstanding job, except to say that Town residents should be very concerned about the operation of their government . . . and to give you the links.. . .
A cover-up in the Town of New Hartford...say it isn't so! It was predictable: the Republican Rubber Stamp does it again. Oneida County legislators will be voting tonight on a contract to privatize aspects of the Griffiss Airport operation, but, still, nothing has been done to address fears raised by Legislator Hennessy that the county's taxpayers are being exposed (the subject of previous posts 1, 2, 3 and 4). At least now the O-D is telling the story of what happened in Plattsburgh with the same contractor. Shortly after a contract was signed, Freeman Holdings left Plattsburgh's airport without first telling county officials, said representatives from Clinton County, where Plattsburgh is located. A contract had been signed, but disagreements arose over whether Clinton County would provide certain services and infrastructure not named in the agreement, the county and company officials said. Oneida County Executive Picente, desperate to get this contract signed, is in denial.
. . . Picente said he was aware of what happened in Clinton County, but said safeguards were in place to protect Oneida County's interests in case of disagreements. Items Freeman Holdings needed at Plattsburgh already are in place in Rome or will be soon, said Picente, who hopes the agreement is approved. "... already have them or are planning to do it" ??? This sounds exactly like Plattsburgh to me . . . an "understanding" or a "handshake deal" done at side bar . . . waiting to go wrong. Legislators, please stop behaving like this is Dogpatch County. Get some professional help and protect our interests as taxpayers. Utica, N.Y., got a higher credit rating yesterday from Moody's Investors Service, albeit still a so-called junk rating, as the city prepares to sell new bonds next week. Moody's raised its rating on Utica's general debt obligations to ''Ba3'' from ''B2.'' That's still a couple of notches below the minimum for investment-grade bonds. Utica Bonds are still junk . . . That's hardly worth celebrating.
. . . The upgrade affects $23 million of general obligation bonds outstanding and $8.5 million in bonds the city plans to sell next week for public improvements. The new rating comes as the city prepares to sell $3.45 million in bonds to pay for the pensions of firefighters under the recently signed contract. Nope . . . no repaired potholes or sidewalks . . . No improved street scapes . . . 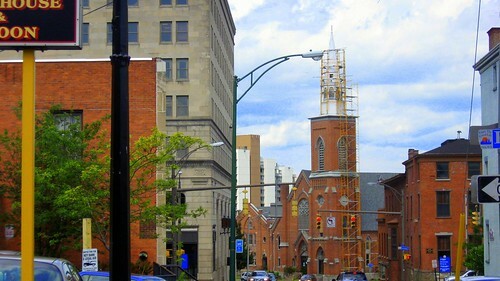 Nothing that will make Utica a more inviting place for people or businesses . . . But a sweetheart deal for some Firefighters who are probably pumping up their pensions with all the overtime generated by the city's ambulance service foisted on the taxpayers by the last administration (which may have increased revenues, but must have increased expenses even more). Bonding for pensions is like taking out a loan to feed oneself. . . and city officials are dining on caviar. Money is being consumed, but not making "improvements" or "repairs." Don't expect the improvement in Utica's bond rating to last long with this approach. Open Meetings Law: Getting Some Teeth . . .
Open Meetings . . . a breath of fresh air . . . may be coming to a hallowed hall of local government near you. Effective August 5, 2008, the new provision states that when it is found by a court that a public body voted in private “in material violation” of the law “or that substantial deliberations occurred in private” that should have occurred in public, the court “shall award costs and reasonable attorney’s fees” to the person or entity that initiated the lawsuit. Is anyone taking bets which public body in our area will be the first to be tested? More Nonsense in New Hartford . .
You can never be too rich or too thin in New Hartford . . . or, apparently, have enough parks. . . at least according to some people. Not even three months after reading of a proposed a baseball field and recreation park in New York Mills, the usual suspects now propose another park, this one near Chapman Road. School teams and town baseball and soccer leagues have created a demand for more fields, outgoing school district Superintendent Daniel Gilligan said. . . .
“It’s all about one thing: It’s about funding more playing-field space for kids,” he said. 1990 Oneida County Census information for New Hartford makes clear that the decline has been going on for years, reporting the then-population of persons ages 5-19 at 4203 (2759 for ages 5-14, and 1444 for ages 15-19). Taking on the burden of more public infrastructure, such as this proposed park, should be the last thing thought of in a region of declining population. Think about all the people who directly or indirectly will make money off this deal, or will otherwise benefit, and you will figure out where the "demand" is coming from. Think your utility bills are too high and the Upstate economy could not get much worse? Think again . . . From the Elmira Star-Gazette: Plan to control air pollution costs at least $120M. . . . But the Regional Greenhouse Gas Initiative (RGGI) is not really controlling pollution unless you consider good old CO2 -- the stuff YOU breath out every day -- the stuff that makes plants grow -- the stuff that gives fizz to your coke -- pollution. You can thank Al Gore and the global warming alarmists for this one. Even if you accept its premise (which I don't), RGGI will achieve undetectable results for climate change, but will devastate what is left of our manufacturing base. This is a very large price to pay for what is, at best, a political statement by former Gov. Patacki. The consequences were forseen here two years ago. The legal authority for the former governor to commit the state to such sweeping changes is still murky. RGGI needs to be undone, now, before it undoes us! No Daylight on the Knights 2 . . .
Two articles today give some answers sought previously in " No Daylight on the Knights" on the fate of the Knights of Columbus building in Utica. The Knights are moving to NY Mills and the Utica Public Library is considering purchasing the building. The sum and substance: A Not-for-Profit after 95 years of Utica support turns its disaster into an opportunity to downsize, and uses its insurance recovery for new quarters elsewhere. Meanwhile, the taxpayers get the opportunity to take on another building to fix and maintain. But Who Will Shovel Them? With a bad case of infrastructure envy, the O-D editors push for sidewalks in New Hartford . . . seemingly because Whitestown has them. New Hartford is considering an amendment to subdivision zoning laws that would require all new developments to construct sidewalks . . . This sounds like every house in a new suburban development will have sidewalks in front of it. Is this really needed?
. . . The village has sidewalks, but not the town. . .
And there is good reason for that: Population Density. Sidewalks are found in villages because the population density justifies them: too many people trying to share the road with vehicles would be unsafe and decreases traffic capacity. There are sufficient numbers of people benefiting to warrant their sharing the cost. While the editors feel that sidewalks would promote a "close knit" feeling in the community, it is really population density (people living close to each other) that does that. If someone chooses to live in a development with 5 acre lots to have room from their neighbors, they do NOT want a "close knit" feeling. Sidewalks in such a place would represent a expense not justified by a need. "a wonderful addition, and you see people walking/running along them all the time"
"All the time" is an exaggeration. How about winter? I seem to recollect a discussion between residents along Chapman and town fathers where the residents were not happy about the sidewalks because (1) they did not choose to have them, (2) they did not want to shovel them, and (3) they did not want the accessibility. It seems that to satisfy the desires of some recreationists, the public is being asked to expand its infrastructure. The costs of this will ultimately fall on either Town taxpayers in general or the adjoining homeowners. Authority Agida . . .
Two appointees at the Power Authority have been axed. One guy was on the job about a year, the other, 2 1/2 years. . . . But what a way to go . . .
A former senior authority official who is still close to the agency and alerted The Post to the severance packages, said: "It is a sad day when two people who spent only 36 months at the authority get to walk away with $300,000 after they are fired." According to "local officials" our Region’s image is key to luring jobs. How many times do we have to listen to this clap trap? You can have your green apple logos, go to marketing events, and *"Call Mohawk Valley Home" until the cows come home, but until we fix what is wrong with this area, we will continue to decline. What is wrong? The cost of doing business is too high. Local officials blaming low job production on poor image is like school officials blaming low grades on poor self-esteem. They deflect from their own responsibility. What have these "local officials" done to bring down the high cost of doing business? Did they ever protest the out of control spending by our schools, such as for the BOCES expansion, or the "performing arts centers" in Clinton or New Hartford -- expansions while the population declines? How about all the spending to duplicate a county airport, while giving away the one we already had? How about spending to benefit particular developers or developments like the new water line in New Hartford? All this spending raises taxes and the cost of doing business for those not on the public dole. It is caused by bad local decisions. But our "local officials" who can't even find themselves on a map push for more of the same. What have these "local officials" done to relieve us of some of the state-imposed burdens? What about the tax for using our Main Street, the Thruway tolls? Those tolls really encourage businesses to set up shop here - not. You hear hardly a rustle of paper from our "local officials" in protest. No, image is NOT the problem. Let Them Eat Cake 2 . . .
A hotel project in the Town of Verona has received a tax break, but not the full package . . ."
... the company did not get the requested 10-year partial property tax break or exemption from sales tax on construction materials, and building equipment and furnishings. By its own policy, the IDA does not normally support retail projects to avoid the appearance of favoring one business over similar ones and, instead, focuses more on commercial areas like manufacturing. Sounds reasonable, until you read the fine print: a Microtel down the street opened without any breaks. Obviously not all hotels are alike. Sounds reasonable, until you think that back in February, the tax breaks were given to a residential development in Kirkland (i.e., not commercial, not manufacturing) Do all residential developments get this break? Or are some residential developers (like hoteliers) favored over others? What about "appearances?" Ad hoc decisions? Arbitrary and capricious decisions? What standards are applied? Who decides? Where are they written? Since all taxpayers are affected (because some get breaks and others do not) our County Legislature would seem to have jurisdiction over this area. Did they give IDA a set of reasonable standards, or did they simply delegate their responsibility to unelected officials? Just what IS the IDA's "policy?" Caught Flat Footed . . . I don't often comment about national/world issues here (except on Global Warming) but the recent events in (former Soviet) Georgia and today's story from the AP, "Russia: Poland risks attack because of US missiles," should be of concern. If Russia attacked Poland, what would we do? And if we fought back, how long would we last? Per the Sentinel, F.X. Matt Brewery has asked county officials for tax breaks as it rebuilds from its May 29th fire. IDA Executive Director Shawna M. Papale said the firm is seeking "standard" incentives available through her agency. She identified them as relief from sales tax and mortgage recording tax and a payment-in-lieu-of-taxes package. The mortgage recording tax in the county is 1 percent. That means, for example, on an IDA-backed project involving a $1.5 million mortgage, the exemption would save the business $15,000. Eligible firms can save the sales tax on materials and equipment purchased during the project construction period with approval from the IDA. The sales tax in the county is 8.75 percent, consisting of 4 percent state sales tax and 4.75 percent county sales tax. How about everyone else? Did you get similar tax breaks from the county when you built your business, or your home, or when you had a loss? Why is this the taxpayers' responsibility? Or is this simply an admission that taxes have gotten SO out of hand that the tax burden crushes entrepreneurship? One gets the impression that in Oneida County if you are big enough, important enough, or connected enough, you can count on government to help you dip your ladle into the bottomless taxpayers' pot. Everybody else? "Let them eat cake." Slums Along the Mohawk (new to Fault Line's Blogroll) presents the case against sharing services in the Cobleskill area, where eliminating Village government is being considered. ...Trustee Mark Galasso and Mayor Mike Sellers (Cobleskill’s oddest couple, to be sure) have been feverishly pushing consolidation. Galasso’s support for cannibalizing the Village can be explained by his own thirst for Village water and his support for unrestrained sprawl development. Mayor Sellers on the other hand should know better. Both of these individuals need to take a step back and consider the costs and not just the savings associated with consolidation..
Sean makes some good points in his post . . . as well as in some earlier ones on economic development and the appropriate way to extend water and sewer lines. Read these posts, and then see if they give you a different perspective on the "economic development" that has already occurred in Greater Utica. Oneida County is not funding the D.A.R.E. program next year and the OD calls this a "disservice." The drug and alcohol awareness program helped educate fifth- and sixth-grade students each year about the dangers of illegal substances as well as the ramifications of getting behind the wheel of a car while under the influence. The presence of drugs and the number of driving while intoxicated cases do not seem to be going away in this area. Obviously drug "education" has NOT been the answer because after educating almost a generation of kids on the dangers, the problem still remains. D.A.R.E. may have even contributed to the problem by making drugs and their effects familiar, lessening fear, and giving children false confidence that they could handle experimentation. A better approach to the drug problem is more policing and crushing punishment. D.A.R.E. 's loss should be a welcome gain to our school children. Frankly, I always thought D.A.R.E. with all its special projects was a distraction (among many), and contributed to our youth finishing school without basic competencies. Eliminating D.A.R.E. will free up time for education basics. Dumping D.A.R.E. will eliminate an ineffective use of taxpayer money, and eliminate a distraction in school. Do it! The county then signed a deal with Millionair, a company with 31 sites around the country and the Caribbean. But the Millionair deal never materialized as the company refused to show up for work on opening day of the airport after the county refused to supply additional items that Millionair asked for after they signed the contract. The loss of Millionair left the county in a difficult position without a fixed-base operator as planes were beginning to land and take off. Will our legislators please get off their duffs and represent the PEOPLE in this deal instead of working for the politically connected or turning this into a political football. No one is saying that privatization should not occur. No one is saying that the proposed vendor should not be approved. But it is obvious that more work needs to be done before the deal is approved. Questions need to be answered. Protective clauses need to be implemented. And the airport needs a business plan that clearly demonstrates it is being positioned to fill a need that exists. The Democrat minority is in the right on this issue. Protect us taxpayers! Gone and Going . . .
Three hundred more jobs are gone from the area, Honeywell moving them to China. And 2000 more appear to be on their way out at New Process Gear. Gov. Patterson is on the right track, calling for $1Billion in cuts to balance the NY Budget. But he needs to do a lot more to make New York competitive at retaining jobs like those at Honeywell and NPG. Overtaxation is the #1 issue, with cost of utilities close behind. Favoring some groups/businesses has always been at the expense of everyone else -- and it is the "everyone else" who are leaving. Cut out the special gifts to IBM, AMD, etc. and the Construction Lobby-Teachers Union alliance and other lobbies and just maybe more companies will stick around or even set up shop. Gov . . . You can do it . . . and We can help. Pension Abuse . . .
New York State educators hit pay dirt with pensions: A retired superintendent collecting $205,000+/year. . . a retired math teacher collecting $90,000/year . . . some pensions exceeding salaries while working! Padding pensions with overtime or deals like these has been going on for years and years, but does anyone stop it? Check out what your favorite school pensioner might be collecting. The Buffalo News has posted the state's database. Is This Why We Need NYRI? "SHOCKING POWER SCAM JOLT$ NY CONSUMERS" screams the headline in the NY Post. ...electricity users across the state were scammed out of hundreds of millions of dollars - and New Yorkers were put at risk of a blackout - by an elaborate plan to sell power out of state, explosive documents filed with federal regulators charge . . . Documents filed with the Federal Energy Regulatory Commission suggest the scheme began in January and ended July 22, when it was shut down by the New York Independent System Operator, which runs the state's power grid. The plot involved contracts to sell electricity from upstate power plants to buyers in the mid-Atlantic grid, which includes New Jersey, Pennsylvania and other states. . . . According to the article, when they tried to move all this power around, the grid got clogged, challenging engineers and threatening a blackout. Just think how much easier it would have been to pull off this scheme with NYRI! Boos to the OD for missing the point in today's editorial "Privatization right course for airport" which can be interpreted as urging the legislature to approve the pending contract involving a Million Air franchisee. No one disputes that privatization is a way of bringing expertise to a County where lack thereof is obvious. But, as Ross Perot used to say, "The devil is in the details" and, unfortunately, there appear to be too few of them spelled out. Questions have been asked, and satisfactory answers not received. The legislature needs to do more work before approving this proposal. Congratulations to The Shadowman on its 200th post! What you guys do with light and our old city is magic. . . . Kudos to the O-D for today's story about the Oneida County Convention and Visitors Bureau. Although the "bed tax" does not affect residents directly because it is paid by overnight guests in area lodgings, it nevertheless is money siphoned off the local economy by county government . . . money that might be put to more productive use by the area establishments collecting the tax, or by the visitors themselves at other area establishments. The bureau does little to track travelers and tourism patterns in the Mohawk Valley . . .
...it was already planning to begin monitoring its own success rate and that it’s doing the best it can with a limited budget. Sure, now that it got caught unable to demonstrate any value in return for the ability to skim $$ from lodging transactions! It's amazing how when government fails, it turns the failure into an excuse to ask for more. Sounds like a boondoggle, no? Mansukh Paghdal, owner of Rome’s Quality Inn, expressed anger at what he said was the bureau’s bias in favor of certain other hotels. “They are totally no good, because they are only working for certain people,” he said. Paghdal said he paid $25,000 a year in bed tax and didn’t feel he was getting his money’s worth. . .
Convention and Visitors Bureau President Paul Ziegler said the Quality Inn might be suffering because of a stabbing that happened in March outside the adjoining Denny’s restaurant. Or maybe it's because Mr. Paghdal's accusation is true, as a comparison of the CVB descriptions of the Quality Inn and the Inn at the Beeches seems to suggest. Enough of government taking money from business people and using it to benefit only those who are "connected." The Times-Union has put on-line the entire New York State public payroll. Similar information was recently posted on www.SeeThroughNY.net, although it did not seem to work that fast. Hopefully these will be improved to show overtime as is done in California. While some employees may complain, it is only right that those paying the bills know who is getting their money. Let's see if our local governments, authorities, economic development agencies and school districts have the nerve to follow suit. As a followup to yesterday's How Bad Can It Get? . . . post, a kind reader sent some links to remind me that a lot of Federal money is being poured into the Griff. Another $20,000,000 is planned for 2007-2011! BIG Federal $$$ came with the Griffiss AFB closure at the Rome Facility (RME). The rest is history: contractors got rich simply duplicating at RME what was already working well (and appropriately sized) in Whitestown (UCA); and then OC literally gave away meticulously maintained UCA to the "pie in the sky" Homeland Security Center that predictably has amounted to zero, but will ensure that UCA never flies again. There appear to be NO business plans for UCA and RME . . . except to keep spending money and hope that something good happens. How Bad Can It Get? . . .
Losses at Griffiss are currently $2 million/year as opposed to $300K-500K at the old airport. How bad can it get? After listening Wednesday to Mr. Joseph's responses to Mr. Hennessey's concerns over the proposed contract with Freeman Holdings on WIBX' "First Look," I think we're being led to a mid-air collision. A video of the entire discussion is posted on CNY Homepage.com. Listen to it yourself and see if it makes you uneasy too. The County's bidding process is a sham. Our airport commissioner contacted the same firms that he contacted when he was commissioner in Plattsburg, and produced the same results: one bid [8:00]. Mr. Joseph interviewed a prospect in Syracuse, who did not submit a bid. Meanwhile the County advertised its RFP in only one trade publication on Feb 8th, and set a deadline for inquiries on February 10th [9:00]. One proposal was received in response to the RFP. It's obvious that personal connections were counted upon to secure the vendor rather than the bidding process. Calling for inquiries within 2 days of RFP publication strongly suggests that the County already found a vendor ... that no one else need apply ... that the publication was only to make things "legal." This style of solicitation makes it appear that you have to know someone if you want to do business in Oneida County. Could that explain why so many stay away? The County does not know its competition, and sees no need to know. The discussion reveals that Oneida County hopes to attract business from Bangor International in Maine, but the administration never bothered to find out what Bangor had to offer. [10:00-12:00] Joseph said that Bangor had no bearing on what happens here. When it became obvious that Joseph et al had not done their homework, he called Hennessey naive [17:00]. The County sees no need for a "security deposit" or escape clauses in the contract, preferring, instead, to trust the parties involved. Mr. Hennessy noted that Freeman Holdings walked away from its contract in Plattsburgh [12:00], and felt this indicated the need for a "security deposit" and an asset inventory list to protect taxpayers in the event the same thing happened here. Joseph implied that Hennessey was besmirching Freeman, and defended "Chris" Freeman's position in the Plattsburgh dispute. Joseph alleged that a "handshake" deal was broken by Plattsburgh [14:30]. Personal attacks on Hennessey will not protect taxpayers if things go wrong. Furnishings and equipment are no security when you don't know what you're getting because the County requires no asset inventory [27:30], and they are not fungible. Million Aire's judgment of Freeman's reliability is no substitute for the County getting some of its $ix-figure employees off their duffs to perform "due diligence" and place some protective clauses in the contract. Joseph's responses make clear that he and his committee have become so vested in the process of securing the vendor and negotiating the contract that they have lost their objectivity. They trust the chosen vendor as part of "the team." Sewer to Schuyler: Passing Costs to Utica Residents? Oneida County wants to lend a 'helping hand' to its sister County of Herkimer -- but will Oneida County make residents of the City of Utica pay for its 'generosity'? If Herkimer County chooses a site in Schuyler for its new jail it will need sewer services from the Oneida County Part County Sewage Treatment Plant. But while Oneida County looks forward to enhancing its revenue, what will be the cost and who will pay? The DEC expressed some concerns about a year ago with the capacity of the Oneida County Sewer District Treatment Plant in Utica . . .
Oneida County officials pooh-pooh the capacity issue, but remember, these are the same people who are now under a Consent Order from NYSDEC due to their mismanagement of the sewer system. Can we accept what these people say at face value? Simply put: There IS an issue of system capacity. The treatment plant in Utica was sized to treat not only sewage from separate sanitary waste lines, but also a diluted waste-storm water combination from the old combined sewers owned by the City of Utica (maintenance of which is paid for by Utica residents in their separate city sewer charges). This dilute waste takes up a LOT of treatment capacity, however this scheme was permitted by the Clean Water Act in recognition that it would be impracticable to eliminate combined sewers in old cities such as Utica. [See last summer's Consent Order Primer series of posts]. If Utica were made to remove storm water from its combined system, it would free up a lot of capacity that could be redistributed to other areas . . . such as Schuyler, New Hartford and other suburbs. "It is the County's position that the City of Utica and the NYSDEC should be exploring other alternatives for treating CSO's rather than sending them to the WPCP. The capacity of the WPCP should be reserved for treating sanitary wastes rather than combined wastes"
It would seem, then, that Oneida County intends to make Uticans pay to remove storm water from their combined sewers to create more treatment capacity that the County would be able to sell to others -- such as Schuyler. Why should Utica residents pay to free up treatment capacity for Schuyler's (or New Hartford's) use? New areas to be added onto the system should be required to pay the cost of creating the treatment capacity that they will require -- whether that capacity is created by adding onto the treatment plant, or by removing Utica's storm water from the system. Gifts of Taxpayer's Money . . . Isn't this nice? A few along Woods Highway gaining access to public water. Taxpayers paid $100,000 for the first 1,300 feet of the water line to be installed on Woods Road, Highway Superintendent Roger Cleveland said. Tell me . . . since when do the Taxpayers get charged with the construction of a water line to serve private residences and developments? Why isn't this a gift of public monies and facilities to private entities . . . something that our State Constitution expressly forbids? It looks like we are going to get an answer to that question . . .
"Please join us at noon today in Niagara Square (Buffalo) for an impromptu rally and press conference. Bring pitchforks. Maybe this could be the spark that ignites a true tax revolt." Taking the Symphony Out of Utica . . . The 2008-2009 Utica Symphony schedule is now posted, and out of 5 concerts, the orchestra will perform only the Holiday concert at the Stanley. All the other performances will be at the Clinton Performing Arts Center. Maybe it's just me, but I think that most people who donate to the Utica Symphony expect to be able to hear more than just a holiday concert in Utica. . . . And I think that most people who donate to the Stanley expect the theater to host the community's symphony more than once during the season. I don't know who is running these institutions, but they need to think twice about what they are doing. Both institutions depend on public support. The public purse is only so deep. It should not be too much to expect both to support each other, especially when personal budgets are being stretched to the limit. If the Stanley hosted the Symphony more often, the publics' donations to either effectively go farther. If these institutions do not support each other, they run the risk of losing the publics' support as well. It's Main St., Not Wall St. This past week we got the bad news on the state of NY's economy. The governor, in a rare move, took to the airwaves to outline New York's fiscal problems. The state, according to projections, faces a three-year budget deficit of $26.2 billion. The reason? Wall Street, the state's financial engine, is, to put it mildly, in need of a tune up. Dwindling Wall Street profits have led to a drop in tax revenue, putting the state, Paterson said, in a recession. Wall Street. There's the problem: The State has allowed itself to become dependent on Wall Street to be its "financial engine." Trading stocks . . . Pushing paper . . . Taking one's cut . . . Easy money. . . It wasn't always so. New York used to have a diversified economy. New York used to depend on Main Street. We made things: in the steel mills and refineries of Buffalo ... in the knitting mills and electronic plants of Utica, Central New York and the Mohawk Valley ... in the garment district of New York City ... in the aircraft plants of Long Island. We grew things ... from the apples, potatoes, and dairy products Upstate to the fresh vegetables and ducks on the coastal plain. We moved things ... by barge, rail and road, and through ports ... leveraging topography and strategic location to get products to consumers cheaply. 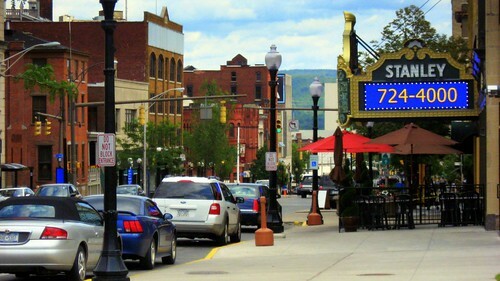 Main Street and New York State thrived. But we lost our vitality somewhere along the line ... and don't make, grow, or move to the extent that we used to. Others are paid now to do these things ... people far away. Sure, national and global policy changes and happenings can be blamed for New York's decline, but the current condition started to develop well before these things came into play. Perhaps it was the shift in power in the direction of Wall Street due to the reapportionment of the state senate during the 1960s. Perhaps it was laziness: it's easier to push papers than build factories and keep them running. Perhaps it was greed and the desire for instant riches, people playing the system to get ahead. Or perhaps Main Street's needs were simply taken for granted while others were given higher priority. Regardless, government in New York State lost focus on what made Main Street work, placed heavy burdens on Main Street, and became dependent on Wall Street -- both literally for the money it took in, and figuratively as a way of conducting its own business. "Deals" were counted upon to solve all problems. So now New York is having financial problems, and all on Main Street are expected to sacrifice. What will the people and businesses in New York have to do without? We still need government to protect us from crime, maintain our infrastructure, protect our environment, keep our food and water supplies safe, educate our children, and, generally, create and enforce rules and maintain a "safety net" of services that allow us to get along with one another with some semblance of order, civility, and dignity. Will these things be cut 5%, 10% or 25%? That seems to be the "easy" way of making "hard" decisions... make cuts across-the-board. Share the misery. That approach ignores the reality that some cuts could be devastating while others will not be missed by the general public at all. $Millions for "Member items:" special projects for special people and groups that keep special legislators in office. $Millions for public jobs merely created as rewards to those politically connected. $Millions for overtime abuse by police, corrections officers, and others who are close to their retirement and are looking for their "high 3" years to inflate their pensions. $150 million for IBM's latest proposed facility. $400+ million for the Albany convention center. $Millions on "economic development" programs. The above represents a Wall Street "Let's make a deal" mindset. Which is fine if you are risking your own money, and not the taxpayers'. Anyone with real experience in business will tell you that most new business ventures fail. Cut out the deals, instead . . .
Use the savings to balance the budget, slash taxes, get rid of business-robbing nuisance fees (including the Thruway tolls) . . . And then get out of the way while Main Street NYS decides for itself what will work in New York. $2 Million Per Year . . .
That's what Oneida County taxpayers are losing on the new "Oneida County-Griffiss International Airport" according to the Observer-Dispatch today which asks the question "Is privatization the answer or a huge mistake?" Asking such a question now is like closing the barn door after the horse has escaped. . . The huge mistake was moving the Oneida County Airport to Griffiss to begin with. when they decided to move the County Airport to Griffiss. when they made the move without a plan for the old airport in Whitestown. when they arranged and later agreed for the State to take the old airport for a Homeland Security Training Center and renovated (destroyed) the terminal building for classrooms. when they entered into a long term lease of the old airport with the State with no escape clause. when they squandered federal funds to duplicate at Griffiss what they already had at the old airport. when they borrowed several times to duplicate at Griffiss what they already had at the old airport. If you looked at the links, common sense should have told these people what they were getting us into. But common sense is out the window where there is money to be made and political careers to be advanced. It is obvious that some people must have gotten awfully rich with all the new construction. And given the lack of transparency in all the above decisions, it's obvious that people were given their marching orders. (There are lessons to be learned here, but won't be, because the local media fails to examine the who and how behind the decisions.) But where do we go from here? When you realize that you've dug yourself into a hole, the first thing you should do is to stop digging! At this point, the County is prepared to dig deeper! Questions are being asked that are not being adequately answered. Again, we have a proposed contract with no escape clause if things do not work out. Mr. Fiorini pushed for the move to Rome which got us into this mess, and has in the past cut off questioning. That needs to stop. We should have no confidence that the County has researched its options (as claimed by Mr. Picente) based on the County's track record to date. Privatization can bring to Oneida County the expertise that it obviously lacks. It could also create a convenient scapegoat when things go under (which may be the motivating factor here). Regardless, business-as-usual must end. No more borrowing, no more unanswered questions, and no more contracts without provisions that protect the taxpayers if things don't go as planned. Pataki Chutzpah . . .
Can you believe how "full of himself" this guy is: Pataki sees museum noting his Albany years. Three-term governor and failed presidential hopeful George Pataki has a new project: a museum and learning center honoring his administration. . .
Top Pataki aides are raising money for the museum, which has little precedent among U.S. museums or educational institutions. . . . Backers hope to raise $500,000 in private funds in the first year . . . The effort is being headed by Charles Gargano, who was Pataki's top statewide economic development official. Hopefully Mr. Gargano and Mr. Pataki will be successful: As successful as they were at reviving the upstate economy and as successful as they were at controlling state spending. New York's current fiscal mess was not created by the Spitzer/Patterson administration. It was created by Mr. Pataki's abandonment of the conservative principles that got him elected in the first place. After the welcome initial housecleaning and honeymoon (about 18 months) he became every bit as bad as what preceded him -- only the faces of the friends on the take changed. His desire for a museum to honor his Albany years aptly demonstrates how out of touch he was with what he was creating. I believe that "less is more" on this issue . . . more honest . . . but with more potential. Griffiss as an "International Airport" really sounds like a joke... Oneida County acting too big for its britches. No offense, Mr. Picente, I understand that you want "international" to emphasize its port-of-entry status, but to most people, an "international airport" means international passenger service -- and Griffiss has no scheduled passenger service of any kind, nor the facilities to accommodate same. But Griffiss IS a port, with the potential to be a very good one. . . . for cargo. It has not only rail and highway connections, but it's on the Erie canal. Dropping "air" from "airport" allows for the intermodal nature of Griffiss: it can be a rail port, highway port, and canal port all at once. Calling it a "port" also suggests its importance for cargo (which I think is the only niche this airport will successfully fit into) without limiting it to cargo. Anyway, that's my 2 cents: Griffiss Port. Simple, honest, and a name that can be grown into. . . and bought into by all of Central New York.